Warren Buffett is one of the richest men in the world. His company, Berkshire Hathaway, owns or has a stake in over 70 businesses such as Coca Cola, IBM, and American Express. But this is no ordinary billionaire. He's giving 99 percent of his wealth to charity and he thinks rich people should pay higher taxes. "Person to Person" take you to where Buffett's mega deals are done. His private office in Omaha, Neb., is as unconventional as the man himself. CHARLIE ROSE: Why Omaha for you? WARREN BUFFETT: Well, you know, I was born here. I've always been happy here. II've lived various other places -- Washington D.C., New York. ...It's home. And I live five minutes from here. I've lived in the same house for 53 years. I've been in this building for 50 years. My car just automatically drives back and forth (LAUGHS). If I try to take it anyplace else, it won't go. CHARLIE ROSE: So no desire to have lots of, a lot of mansions around the world, a big boat -- all those things that your wealth would allow you to do? WARREN BUFFETT: I have every possession I want. I have a lot of friends who have a lot more possessions. But in some cases, I feel the possession possess them, rather than the other way around. CHARLIE ROSE: There are some references to the University of Nebraska there, the Big Red. Does that football team mean something? Here's a Nebraska helmet signed by Tom Osborne and a number of the top players. I've -- I've been red-shirted myself now for 61 years. But I'm ready to go when the need arises. LARA LOGAN: I see there's a sign that you were pointing to there above your -- your hallway. CHARLIE ROSE: Take us into the hallway. WARREN BUFFETT: Let's go around, and we'll look at that. CHARLIE ROSE: My goodness, look at this. WARREN BUFFETT: We have all kinds of things here... Let's start with some of the sports material. Here's Ted Williams in his first game as a Red Sox player against Holy Cross. CHARLIE ROSE: What do you admire about Ted Williams? WARREN BUFFETT: Ted Williams described in his book, "The Science of Hitting," that the most important thing -- for a hitter -- is to wait for the right pitch. And that's -- exactly the philosophy I have about investing...Wait for the right pitch, yeah, and... wait for the right deal. And it will come... It's the key to investing. CHARLIE ROSE: Is that Tiger Woods I see? LARA LOGAN: Were you any good as a caddy? LARA LOGAN: Can you take us into your office, Warren? WARREN BUFFETT: OK, let's take a look. LARA LOGAN: Wow, that's very nice. LARA LOGAN: How long have you been making deals from here? WARREN BUFFETT: Well, I've been making deals from this building for -- for 50 years. ...and I love this building and wonderful landlord. And -- they keep the rent down for me. (LAUGHS) Well, I'm a happy guy here. CHARLIE ROSE: Over your left shoulder, I see a picture of your father. WARREN BUFFETT: Yeah, my dad. That's his campaign picture in 1942. He was 39 years of age then. And he ran for Congress. ...And that picture comes from his campaign card. ...he went on to -- have a few more terms. CHARLIE ROSE: You said to me once, Warren, that he was your hero. WARREN BUFFETT: Absolutely. Absolutely. I never saw my dad do anything as -- in his entire life that -- you wouldn't...feel good about being on the front page of the paper. And -- I mean he was, in every respect. He gave me unconditional love. He was -- supported everything I did. He was a terrific human being. This is his desk right here, from, I don't know, 75 or more years ago. And my sister, older sister, Doris, found this little train that used to be on his desk when we were little kids...she had kept it...having found it, she gave it to me. LARA LOGAN: There's no computer that we can see on your desk. Is there, does that really mean you have no computer in your office at all? WARREN BUFFETT: Not in my office. I'm working on the abacus now. And if I get that mastered we'll go to the multiplication tables. CHARLIE ROSE: There's hope for you yet. ...The phone seems to be the principle instrument there. WARREN BUFFETT: Yeah. It's - it - it -- it is the principle instrument, that, and -- and the pile of reading material ... it's just a question of kind of gathering facts, which come in mostly via print, and then thinking about 'em. And if -- if I can make one good decision a year, you know, we'll do OK.
CHARLIE ROSE: Well, take the IBM investment which you recently made. I mean it is said...you were reading the annual report, and you saw opportunity there to invest in a company because you saw potential. LARA LOGAN: What would you say most investors do wrong? 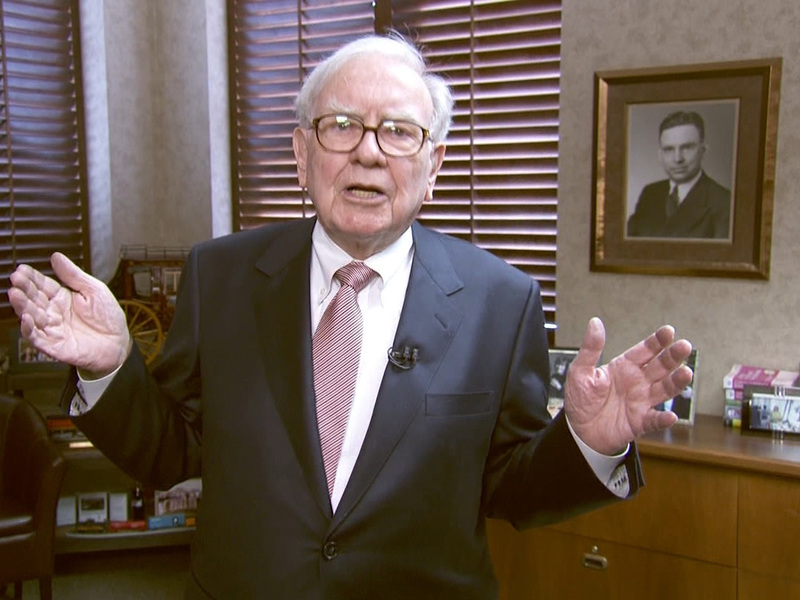 WARREN BUFFETT: Well, they-- they-- think that what is important is next quarter's earnings. And they think they have to trade around, and they have to read news events and change their opinion ...And if people would...adopt the philosophy that they're buying something to hold for the rest of their life. ...they can't go wrong doing that. CHARLIE ROSE: What are the other photographs in this room that -- that represent something (CLEARS THROAT) important to you? CHARLIE ROSE: You also had received the Medal of Freedom from President Obama in 2010. Is that in this office? WARREN BUFFETT: It's right here. I feel very good about that. CHARLIE ROSE: What does the inscription say? WARREN BUFFETT: Well, it -- it goes on and on. But it -- (LAUGHS) it -- it says some-- it says some nice things-- Charlie. LARA LOGAN: This is the baseball you were talking about. WARREN BUFFETT: Yeah, Willie Mays. We've got...Ted Williams, we got Joe DiMaggio all on the same baseball. LARA LOGAN: Where'd you get that? WARREN BUFFETT: Well, a friend gave it to me. And - and -- and it's got -- you know, it's got a bunch of my boyhood heroes, and they're still my heroes -- on there. CHARLIE ROSE: The New York Post and other newspapers were full of your recent visit to New York, and...you were seen and photographed with Jay-Z. So I thought if I went to this opening -- I wore his -- the tie he gave me. And then, when I saw him, I started looking at his tie. And I said, "You know, Jay, that is one good looking tie." And he said, "Warren," he said, "forget it, you only get one." (LAUGHS) ...but he is a very smart guy. And he's financially smart. WARREN BUFFETT: Here are my children here. Here's Peter and Susie probably giving me little advice at the annual meeting. And that's my son, Howard, over there. CHARLIE ROSE: There's also a picture among the board of directors of Bill Gates. And you have become...obviously, well known because of -- of the commitment to philanthropy and -- and giving -- $30 billion or more to Bill to -- as part of his foundation. That grew out of what? WARREN BUFFETT: Well, it grew out of the fact that, when I was in my 20s, my wife and I decided, after we took care of ourselves and our family reasonably well, that we would probably have a lot of money left over. And the original idea was that I would pile it up, and then some day, she'd unpile it -- (LAUGHS) for philanthropy. WARREN BUFFETT: But...I expected that she would outlive me, and she died in 2004. So I had to come up with another plan to take care of what would be -- now amounted to a very large sum of money, which I wanted to go back to society. ...I go to somebody that's better at it than I am. And you've got not only Bill and Melinda Gates of the Gates Foundation, but you've got my three children, and I've left them-- or I'm giving them significant amounts for their foundations. ...And I feel very good about it. CHARLIE ROSE: You know, there's a lot of talk about America, and whether America's in decline. We've had -- the president mentioned it in his State of the Union address. You feel good and optimistic about America and its future? WARREN BUFFETT: (CHUCKLES) Charlie, America's not in decline. I mean I was born in 1930, just imagine that you had foreseen 25 percent unemployment, 4,000 banks closing, the Dow going, from the day I was born, from 250 down to 42? I mean all kinds of things, a world war coming on. But this country, it moves ahead. CHARLIE ROSE: There is one thing that's come up. It's fairness. And you have been making the point...that it wasn't exactly fair for you to be paying at a lower tax rate than your secretary. ...There is also the -- now the Buffett Rule. Explain to us what the Buffett Rule is. WARREN BUFFETT: It encompasses the idea that people who are extremely rich, who have benefited enormously from this society, should have a tax rate...that's at least as high as the people that work for them. And the people of this office averaged 36 percent. My figure was 17 percent. So clearly-- something is out of whack. And, you know, nobody's gonna pay more than is required. Mitt Romney doesn't, I don't, you know. ...And, incidentally, I don't fault M -- Governor Romney at all. He paid what -- the Congress told him to. ...we were promised that a rising tide would lift all boats. A rising tide has lifted all yachts. If you're gonna talk about shared sacrifice -- we have not had an ounce of shared sacrifice from the very rich. CHARLIE ROSE: When you look at the future, your own future -- are there things that you want to accomplish? Are there goals that still are there for you? WARREN BUFFETT: I'm doing what I love, Charlie. I -- I've got great news for you, Charlie. WARREN BUFFETT: When you're 81, you're (LAUGHS) gonna have more fun than you're having now. I mean 81 is a great year. (LAUGHS) I look forward to doing what I do ... I forget whether it was Mel Ott, when he was playing for the Giants or somebody, said, "You know, they -- you mean they pay me for this?" (LAUGHS) That's the way I feel. CHARLIE ROSE: Warren, thank you very much. This been a remarkable visit. LARA LOGAN: Thank you very much. WARREN BUFFETT: Thanks for joining me. (CHUCKLES) And Charlie, be sure -- be sure, if this is gonna be on with George Clooney (CHUCKLE), be sure you keep explaining to your viewers which one of us is which, because he gets called Warren a lot. CHARLIE ROSE: Oh, does he really? CHARLIE ROSE: -- the way we're pitching this. WARREN BUFFETT: I think that's the way to do it. And I think saying the two is the best way to do it, because you wouldn't want him to feel bad if you're writing this, right? (LAUGHS). Thanks to both of you. Buffett turns to leave and walks back towards his office. CHARLIE ROSE: Go back to work.